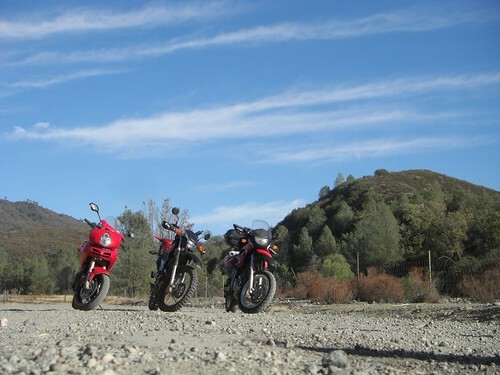 The Sport-Touring.net Bay Area Dual Sport (BADS) group hadn’t gotten together since our trip to San Simeon in April. 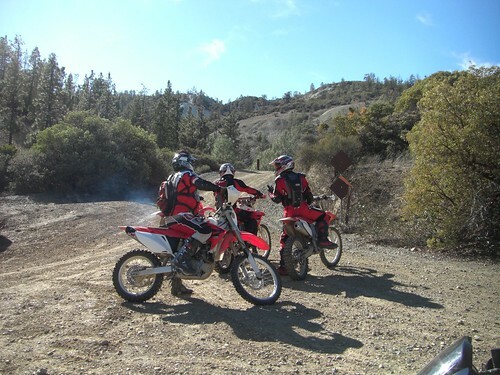 Our aches and pains had duly worn off and so it was time to ride again! 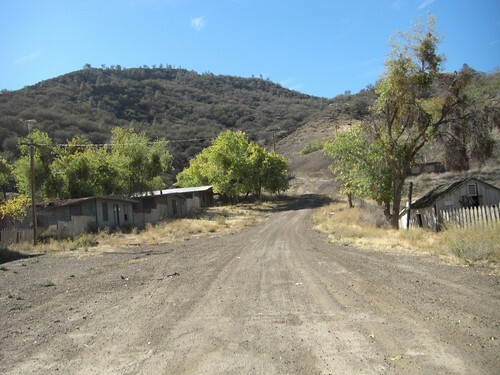 Our destination was New Idria, a ghost town in the Diablo Mountains. 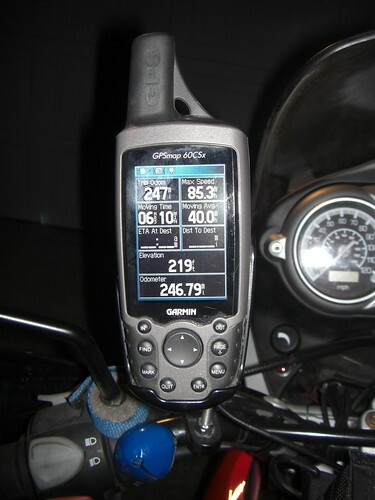 Chris, Andrew, and I met at my house so that Chris could borrow my XT225. The poor guy; the last time, he’d borrowed the white XT with stock tires on. The black XT’s dirt worthy Kendas made the freeway ride to Hollister a literal pain for Chris and we stopped partway down so we could switch bikes. 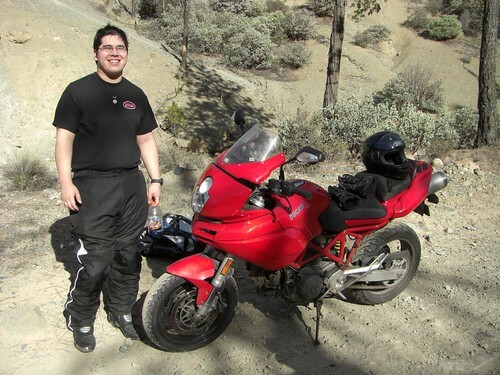 I’m much more used to the XT’s proclivity to try to shake you off at 60mph, and Chris enjoyed the “couch”-like nature of the Beemer. 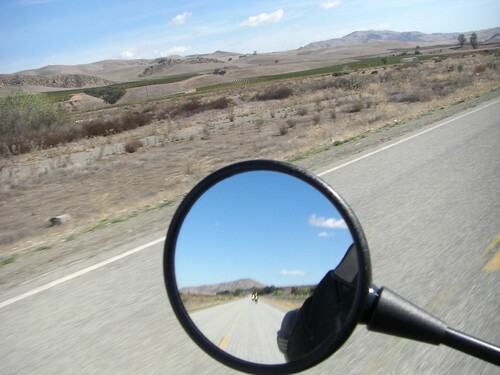 After a thoroughly adequate brunch at Jerry’s Restaurant in Hollister, we gassed up and got ready to depart. 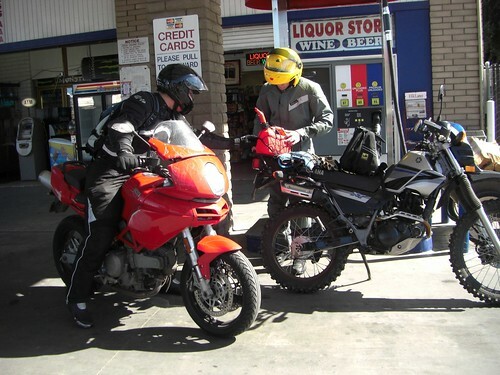 We weren’t sure whether the XT would make it through the 130-mile loop, so we brought along a spare gas can. How many STNers does it take to bungee on a gas can? 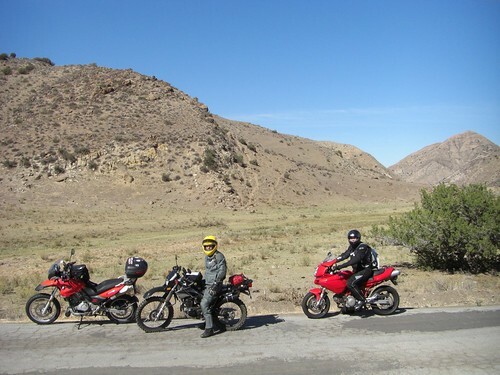 We rode south for a little ways on Highway 25 and then turned east onto Panoche Road (also called J1). 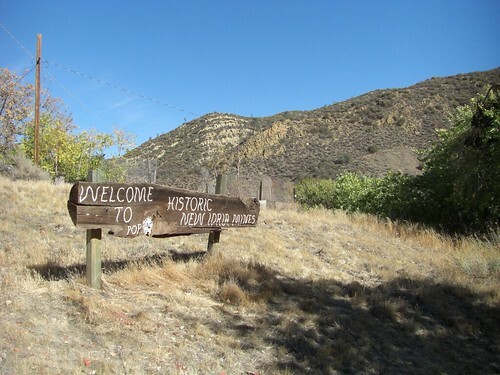 There’s a historical marker for the New Idria mines at that intersection — I’ve passed it on Hwy 25 a bazillion times and always wished I was turning onto Panoche to visit that mystery ghost town. Now I finally was! 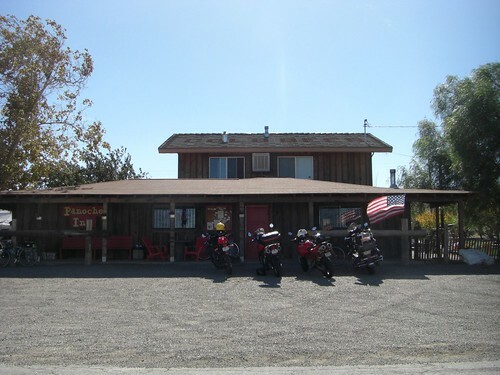 We took a snack break at the tiny Panoche Inn, the only structure for miles around. There were many bicyclists filling up their Camelbaks from the bar’s sink, so I did the same. 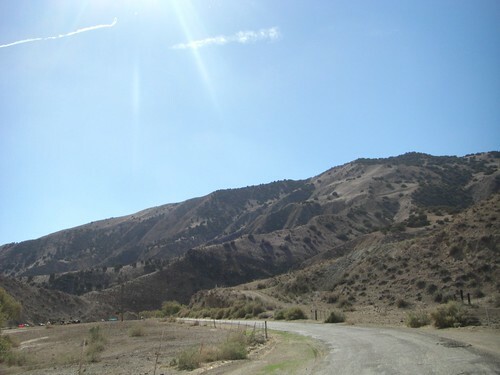 Past the Panoche Inn, the road changes to New Idria Road, which is gloriously desolate. 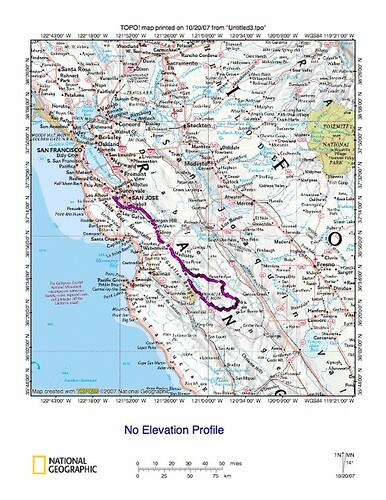 Sections of it strongly reminded me of Mexico Highway 3 between Tecate and Ensenada. 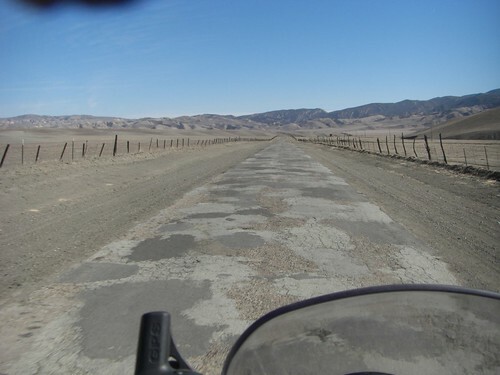 As we neared the ghost town of New Idria, the road turned into a pockmarked patchwork. Each square jarred my kidneys and compressed my spine. 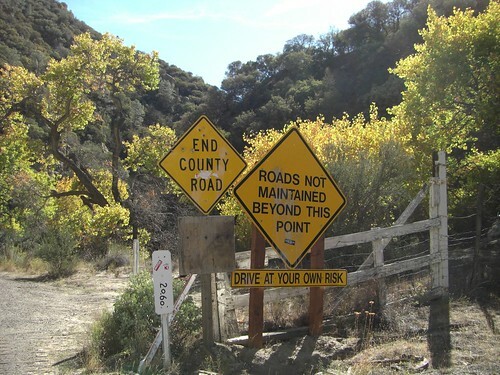 I’m convinced that this road actively made me shorter. Just after these signs, the pavement fell away. 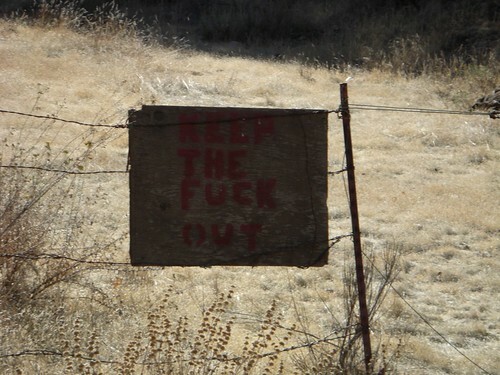 Now, I don’t mean the pavement ended. Nor do I mean that the pavement turned worse. I mean the pavement fell away, in chunks, leaving chasms and washouts and pieces of leftover concrete angled and sticking out of the road like little teeth. Fun! 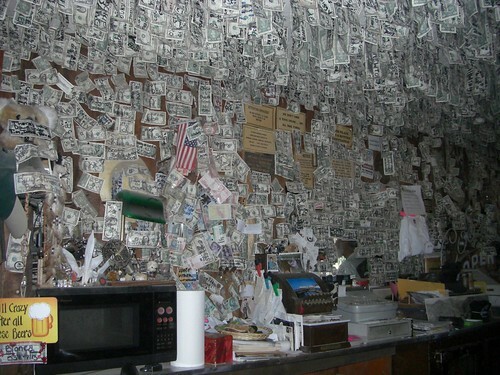 Welcome to New Idria, population “me”. Do they want you here? A little about New Idria itself. 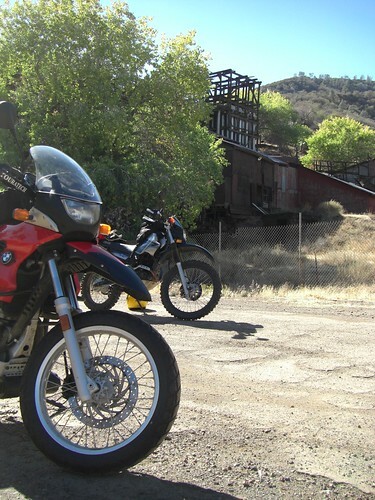 At its heyday, the quicksilver (mercury) mine supported a town of about 3000 people. 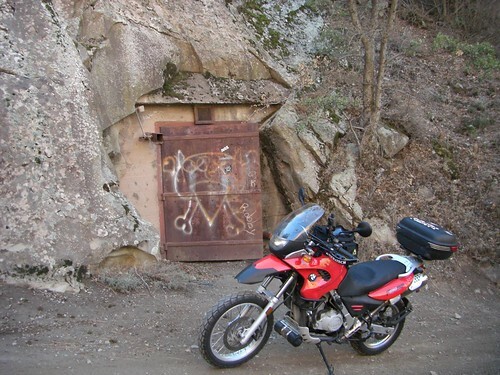 It was a populated area from 1854 until the mine was shut in 1972. The town is called New Idria after the second-largest quicksilver mine in the world in Idrija, Slovenia. 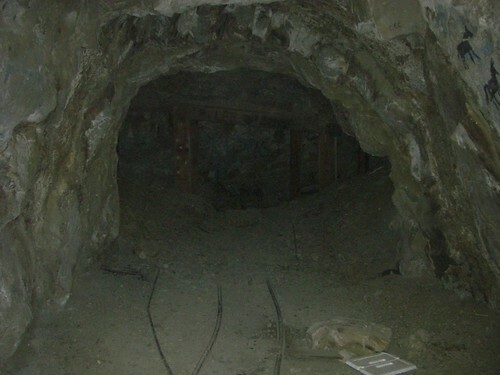 New Idria was considered a “sister mine” to the New Almaden mine about 80 miles to the north (itself named for the world’s largest quicksilver mine in Almaden, Spain). 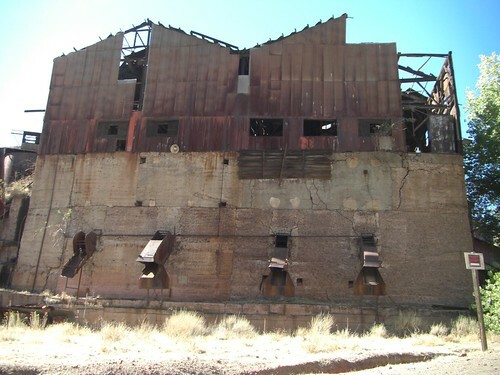 This building also contained the ore feeders, ore bins, rotary kilns, calcine bins, dust collectors, steel condensers, exhaust system, hoeing tables, and bottling room. 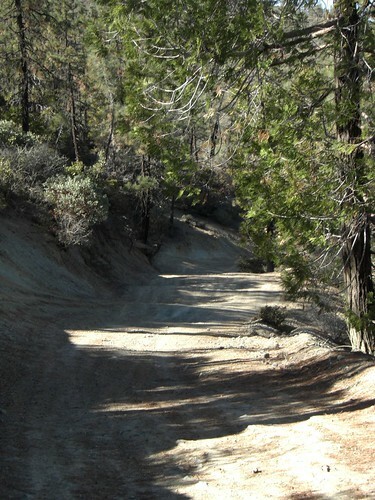 Past New Idria, the road switches names to Clear Creek Road and enters the Clear Creek Management Area. I’d never been to Clear Creek before. 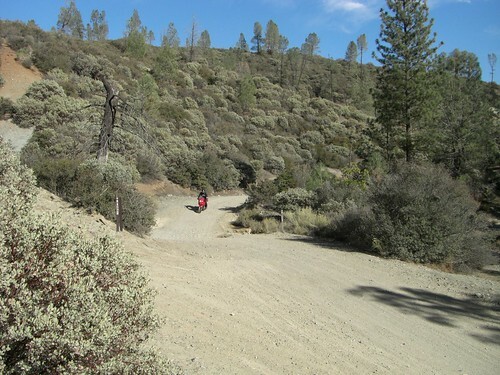 It’s an OHV park, so there were a few dirtbikers zipping about on 2-strokes and generally making us look like slow heavy pigs on our dualsports. 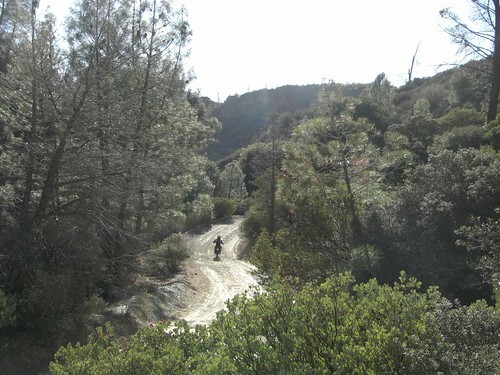 I thought I saw one guy hillclimb his bike up a slope so steep that the only explanation is that the natural asbestos in the soil was making me hallucinate. 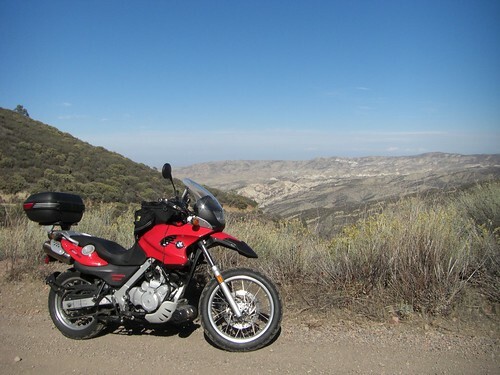 But some of it could charitably be considered “better suited for lighter bikes”. 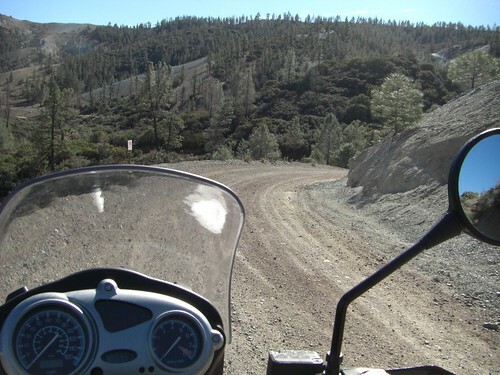 There was at least one long section of steep uphill rocky whoops where I was fairly convinced that I was just going to fly off the edge of the cliff. 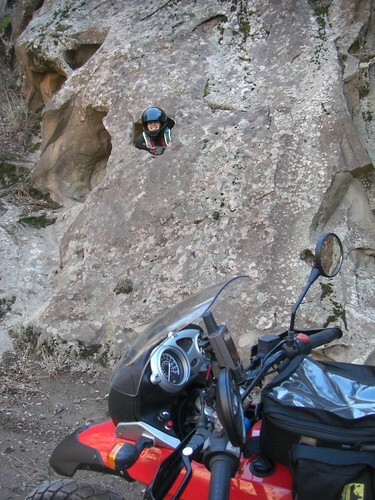 Nothing quite like a 5′ wide trail of rocks and whoops with a rock face on one side and a mountain dropoff on the other. Whee! At a snack break, I walked back down the trail a little to get this picture, which of course, wasn’t nearly as difficult as some of the earlier stuff. 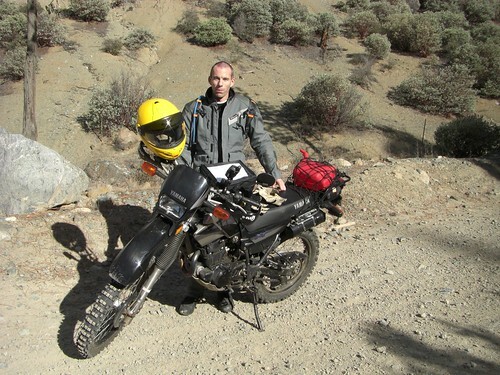 I managed to also be the only one to drop my bike all day….at a photo stop when the bike wasn’t even on! 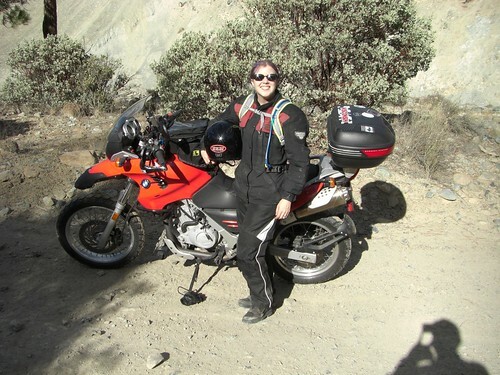 I mounted the Beemer to ride across Clear Creek, misjudged the slant of the road, and tipped over onto my right side. Naturally this broke off a mirror, grr. 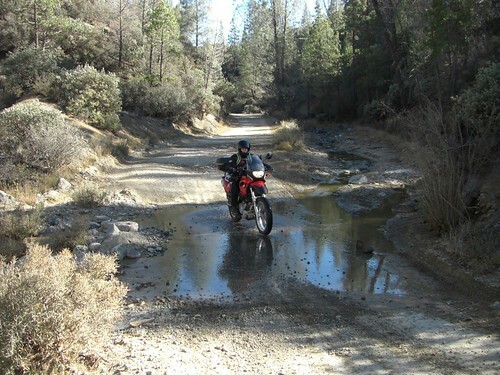 The creek crossings were really nothing. After Australia, anything that won’t actively sweep you away to your death in crocodile-infested waters don’t even register in my mind. 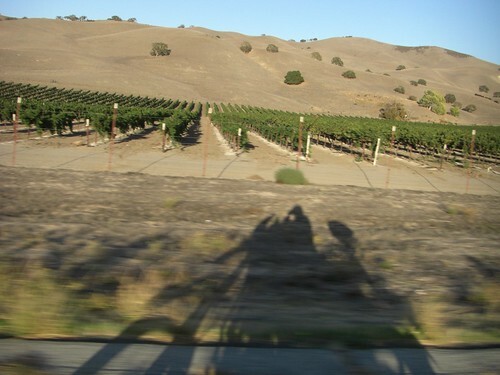 At our next snack break, we discovered the hidden talent of my bike: the Givi Winery! 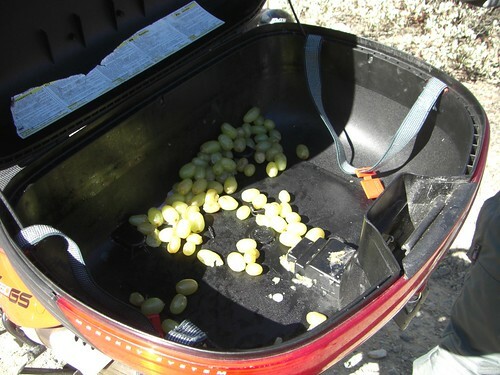 Apparently, grapes + whoops + washouts + tipover = the first step towards becoming a sommelier. 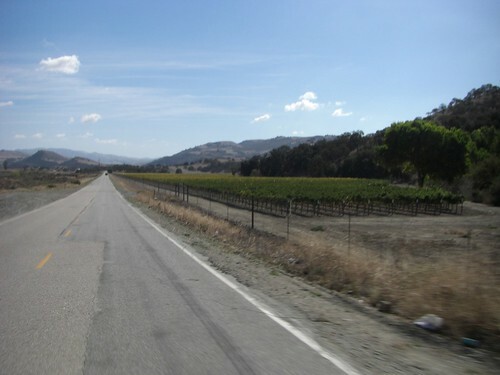 We continued on and the road grew tamer and tamer as we reached the western exit of the park. 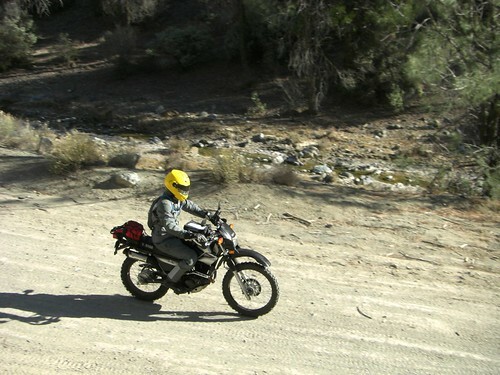 Just as an aside: if I’d have known what kinds of trails these were going to be, I might not have brought the F650GS. As it turned out, though, I’m glad I didn’t know, because the Beemer handled absolutely everything I threw at it (sometimes literally). 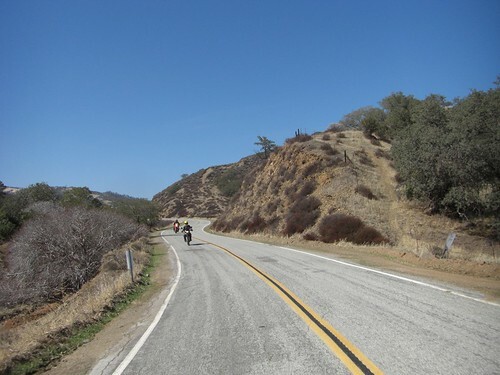 Even with Tourance tires on, the bike soaked up gravel, rocks, dirt, mud, whoops, washouts, hairpins, uphills, and downhills, all with control and grace. 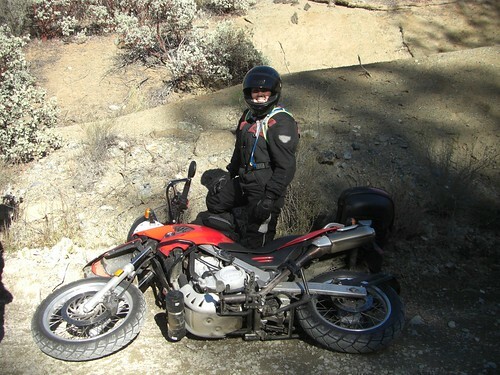 True, I never got out of first gear in the harder sections (my limitations, not the bike’s), but the bike really surpassed all of my expectations. Oh, and even with all the rocks, the PVC tool tube did fine on the skidplate. 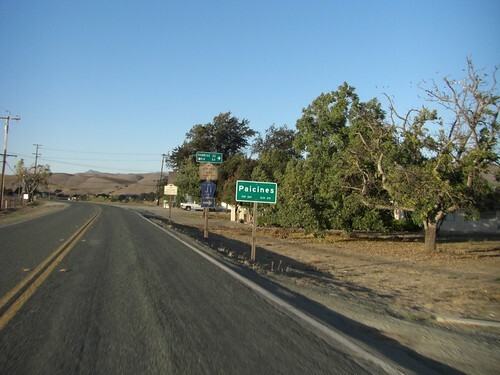 From Old Coalinga, we headed back north on Hwy 25, passing more vineyards and ending the loop back at the intersection of Panoche Road/J1 in Paicines. We had decent veggie pizza at the Neighborhood Pizza restaurant in Hollister and had a thoroughly uneventful ride back up 101 to my house.